‘Golliwog’, The Oxford Companion to Black British History, eds. D. Dabydeen, J. Gilmore and C. Jones (2007), pp.191-2. As neither the Uptons nor Helen Bannerman, creator of Little Black Sambo, filed for copyright, British manufacturers, writers, and artists were free to adopt the character as their own. The earliest golliwog doll was sold at Gamages department store in 1902. Golliwogs were to be found everywhere from postcards to the sixth movement of Claude Debussy’s Children’s Corner, entitled ‘Golliwogg’s Cakewalk’. In 1910 James Robertson & Sons, the British jam manufacturer, adopted a golliwog named Golly as their mascot, featuring him on their packaging with the slogan 'Golly it's Good!' In the 1920s they began producing Golly badges which could be obtained by collecting tokens. 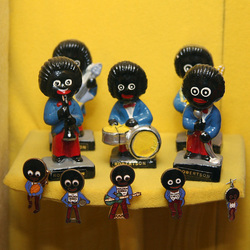 The popularity of golliwogs began to decline after the Second World War, as other toys and games flooded the market. By 1981 only 2,500 were being sold a year. They were also affected by the growth of ‘political correctness’, and what was once seen as a harmless, jolly toy became a controversial political item. In the early 1980s, revised editions of Enid Blyton’s Noddy books replaced Mr. Golly, the golliwog proprietor of the Toytown garage, with a teddy bear. In 1983 the Greater London Council boycotted Robertson products as offensive. In 1988 the character ceased to be used in television advertising. In August 2001, the company replaced Golly entirely with Roald Dahl characters. However, in September 2001 Richard Eddy, deputy leader of Bristol’s Tory councillors, was forced to resign following a scandal involving the erection of a foot-high golliwog on top of a filing cabinet in Bristol Town Hall, in what he called a stand against political correctness. In May 2005, George Wood, a senior Scottish lawyer, was fined £1,500 for telling a joke about golliwogs at a dinner in Falkirk. Despite this, golliwogs are still being produced by British manufacturers Merrythought, who estimate sales of 10,000 a year. In 2006 they stocked twelve different golliwog products, ranging in price from £27.99 to £139.95. Golliwogs have also become desirable collectors’ items, the rarest of Robertson’s Golly badges now sell for more than £1,000. Further reading: Derricks, Clinton, Buy Golly! The History of the Golliwog (2005).